First telecast January 5, 1971, Alias Smith and Jones was the pilot for the popular TV series of the same name. 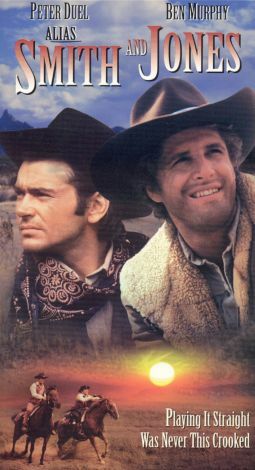 This genial rip-off of Butch Cassidy and the Sundance Kid stars Pete Duel as Hannibal Heyes and Ben Murphy as Kid Curry, two notorious Western bandits who have become folk heroes because of their refusal to kill anyone. Heyes and Curry would like to go straight; the governor offers them that opportunity, provided they can stay out of trouble for one year. Assuming the aliases of Joshua Smith and Thaddeus Jones, Heyes and Curry begin their "retribution" process as tellers in a very tempting, very unguarded bank. Perennial guest star Susan Saint James provides the feminine angle in this tongue-and-cheek effort. Alias Smith and Jones ran until January 1973, by which time Roger Davis had replaced Pete Duel, who committed suicide on the last day of 1971.